Quattro Stagioni is a cycle of four paintings representing the four seasons. Tate’s version is the second of two cycles; the first is in the collection of the Museum of Modern Art, New York. Both cycles were begun in 1993 at Twombly’s studio in Bassano in Teverina (north of Rome) and completed in 1994 at another house owned by the artist in Gaeta on the Tyrrhenian Sea. Born and bred in Lexington, Virginia, Twombly was deeply influenced by Modern European art, particularly twentieth century European painting, and moved to Italy in 1957. Since that date he has worked in Rome and various locations in Italy and the United States as well as travelling widely around the Mediterranean. Throughout his career, Twombly’s paintings have been based on two components – line and paint. In such early works as Panorama 1955 (Daros Collection, Switzerland), a monotone grey canvas is covered in irregular chalk scribbles which hover on the verge of becoming recognisable as letters or ciphers. In the 1960s, daubs, smears and drips of colourful paint applied with a brush, the brush handle and the tips of the artist’s fingers begin to supersede the crayon and graphite marks of his earlier paintings. In some paintings, such as August Notes from Rome 1961 (Hirshorn Museum and Sculpture Garden, Smithsonian Institute, Washington DC), line is almost completely replaced by colourful patches of paint; in others, such as Leda and the Swan 1961 (collection the artist), it is a source of violent energy. Since the mid 1970s, the linear marks frequently take the form of text, introducing a third component: written language. Clumsy capitals or scrawled cursive letters are mixed with doodled shapes and indecipherable scribbles usually in compositional balance with painted elements. The tension between the graphic qualities of linear inscription and the sensual materiality of paint is central to the impact of the work. 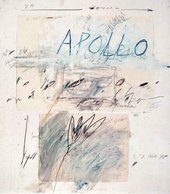 This runs parallel to a tension between intellectual cultural history and intuitive emotional expression enacted in Twombly’s paintings. Classical mythology, literature and historical works of art are appropriated and translated into a visual response which is tactile, visceral and aesthetic. His particular reference to Greek and Roman myths evokes an archaic symbolism, a subject he shares with the American Abstract Expressionists. A generation younger, he is further connected to this movement by his expressive, ‘gestural’ use of paint. Twombly’s representations of the four seasons are typical to his production of the late 1980s and 1990s in which light has become a principal theme. His prominent use of white echoes that of French Impressionists such as Claude Monet (1840-1926) for whom it was an important ingredient in the depiction of light. A series of nine paintings, Untitled 1988 (Cy Twombly Gallery, Houston), portraying the green reflective surfaces of a watery pool, recalls Monet’s celebrated paintings of his water garden at Giverny, France created between 1899 and 1926. Plant life and the sea also recur in Twombly’s imagery of this period. A single work is frequently made up of several parts, as in Quattro Stagioni which is subtitled A Painting in Four Parts. The four seasons as symbols of the natural cycles of birth and death are a classical theme in poetry, music and painting. In Twombly’s Quattro Stagioni strong colours evoking the brilliance of the Mediterranean light are combined with scrawled poetic fragments from several sources. After pre-priming the canvases with cream-coloured gesso, the artist pinned them to the wall and applied individual colours, allowing the paint to dribble down in long, vertical lines. Primavera, or spring, represents the first season of the year. A column of red curved and slashed forms dominates the image. These relate to traditional Egyptian rowing boats which, it has been suggested, symbolise the journey through the underworld in the Egyptian ‘Book of the Dead’ (Bastian, p.37, note 15). Twombly lived for several months in Egypt in the mid 1980s and began to use the symbol of the boat in 1992. In Primavera, the red boat forms are smeared with patches of yellow, as though touched by the sun. In part II, Estate (Tate T07888), echoes of the boat forms in black, over-painted with white, are entirely covered with yellow, perhaps concealed by the blinding summer sun. The yellow patches in Primavera are applied in a central row, drawing the eye upwards to the top of the painting, where they culminate in a bouquet-like form containing touches of purple and pink. Strokes of white paint cover parts of the bouquet and the red boats, obliterate long dribbles of red paint and other smears and form a background for areas of text. The title Primavera, with the artist’s initials and the date ‘June 94’ written in red crayon, is followed by a fragment of poetic text in pencil referring to happiness and emotion ‘that almost overwhelms’. Twombly’s impression of spring is vibrant and celebratory. In each of the four paintings shown here, a different range of colours registers the changing light and temperature of the seasons. In this work, representing spring, a resurgence of energy after winter is depicted in a vertical arrangement of red curves and splashes of yellow. The curves relate to traditional Egyptian boats, which appear in a number of Twombly’s works, including a sculpture in this display. Primavera, the Italian word for spring, appears alongside passages of text that evoke happiness and hope.